This guide will help you to make up to £100 profit every Saturday from horse racing refund offers available on ITV televised races. If you are new to horse racing or horse racing refund offers, I would recommend reading the Beginner's Guide To Horse Racing and Horse Racing Refunds Explained guides first! What Is Saturday ITV Racing? Every Saturday afternoon, ITV broadcasts a 5 to 7 horse races from selected meetings. These races normally come with plenty of offers offered by many bookies, which can be very profitable for matched bettors. If you are new to racing offers, you can do 1 or 2 offers each Saturday whilst you become familiar with them. Whereas if you are looking to make the most out of Saturday’s racing offers, be prepared to allocate your Saturday morning and most of the afternoon to take part in the racing offers. The races usually start around 1:50pm to 4:30pm, and normally consist of 5 to 7 races. Saturday’s racing offers can earn up to £100 profit for a day’s work. Your profits can go even higher than that if you have a larger bankroll and are prepared to take more offers from more bookies. What Are The Bookmaker Offers? If your horse wins at odds of 5.0 and above, get a risk-free bet of the same value as your stake on the next race (up to £50). Bet365 Racing Offer guide. If your horse wins at a starting price of 4.0 and above, get a free bet of the same value as your stake (up to £25). If your horse finishes 2nd or 3rd on the first ITV race, get your stake back as a free bet (up to £20). This offer can be combined with Skybet’s Free Bet Club. Sporting, Betway and Racebets often run a refund if your horse comes 2nd (up to £25). Refund If Horse 2nd guide. Ladbrokes' offers differs from week from week, and sometimes they don’t have any offers. William Hill's '2 Clear' promotion gives you an extra 15% winnings paid as a free bet if your horse wins by 2 lengths. This is a worthwhile offer if there is a strong favourite with close odds. Free Bet if your horse finishes 2nd to the starting price favourite: Paddy (up to £25), 188Bet (up to £25), BetStars (up to £25), UniBet (up to £10), Betfred on selected races (up to £25) Refund If Horse 2nd to SP favourite guide. Which Bookmaker Offers Should You Do? You may want to start with one or two bookies with a lower stake first to familiarize yourself with horse racing bets. It can be very different from placing a bet on a football game, as the odds for horse racing can change very quickly, especially minutes before the race begins. Try to get in on all the main offers listed as 1) to 4) above, as they are easier to get free bets from. If you like, you can try to bet on different horses across the different offers to try to maximize your chances of getting a free bet. For an example, to try to get a free bet from the “money back if 2nd offer”, you can try to bet on the favourite on Skybet, and bet on the 2nd favourite on Betway, and the third favourite on Sportingbet. That way, you increase your chances of betting on a horse that finishes 2nd, getting you a free bet. Where Can I Find This Saturday's Offers? Most of these offers only applies to bets placed after 9am on the day of the race, so if you place a qualifying bet on the night before, it wouldn’t qualify for a free bet. Try to bet on horses with lower odds (8.0 and above), as that horse would be unlikely to win or get 2nd, not to mention that you would require a large amount of money to lay it, tying up your funds for other races. You can see estimated profitability of the offers based on the odds you choose using the Racing Profit Estimator as mentioned in the Racing Refunds Explained article. It might be best if you only bet on a single horse with a bookie for their offer, as bookies may find you suspicious if you bet on multiple horses in an attempt to get their free bet, and will quickly get you gubbed. Besides that, most bookies only apply their offers to the first bet you place on the race. On Saturday mornings after 9am, you can start to look for close matches on the ITV races. However, it can be hard to find close matches if you’re hours away from the races, but if you do find a close match, place a bet and lay it. A very useful tool here is the Oddsmonkey Racing Matcher tool, which can show you the closest match on a race for a bookie. If you cannot find any close matches in the morning, don’t worry. Close matches are often hard to find in horse racing if you are hours away from the race, as mentioned. Close matches often happen 5-10 minutes before the race starts, so try to be at your computer 5-10 minutes before the race and keep a lookout for close matches. Odds change very rapidly in this time, so you may need quick fingers to place your bets and lay it. At this time, I would not recommend using the Oddsmonkey Racing Matcher tool, as the odds are moving too quickly to produce accurate results for the tool. Instead, have the Calculator open, and enter the values as the odds change until you find a match you are satisfied with, and place your bet and lay it. Please do make sure that the horse you are backing is the same horse you are laying (reminder, you are laying as 'normal' in the Calculator and aiming to keep the qualifying loss as low as possible). Again, also make sure that the horse you are laying has enough liquidity for the amount you are laying. Qualifying loss in horse racings can be critical in maintaining profits. Not every race will earn you money, as your horse might not win, or get 2nd place, or the starting favourite might not win. We need to make sure our qualifying losses from these races are significantly less than our profits for the day. It would be ideal if you can get a qualifying loss of less than £1.50 for every £25 staked. If your qualifying loss is more than that, it might be better to choose another horse, or skip the race altogether, as these qualifying losses can accumulate to huge losses for the day! Most bookies allow you to watch a live stream of the horse race that you have placed a bet on. You can watch the stream to find the result of the race. Alternatively, if watching races isn’t for you, you can check the results from a couple of ways. 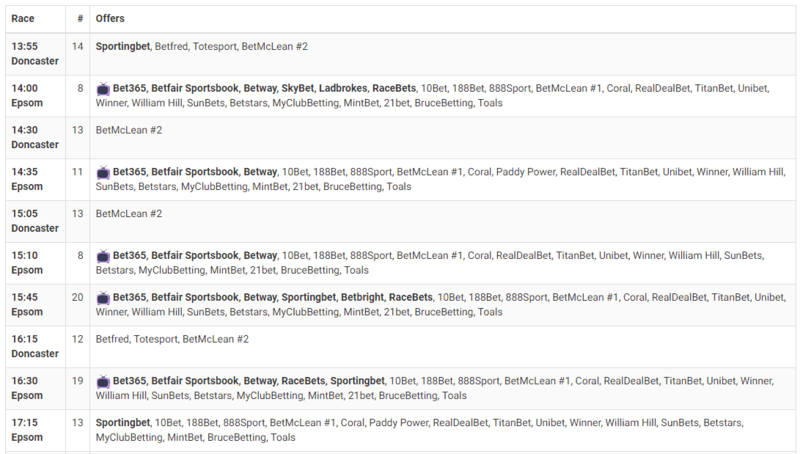 Most bookies show the results of the race if you click on the race again on the bookie. However, the results are normally only shown after a brief period of time, which is usually 10-20 minutes after the race. Sportinglife and AtTheRaces (click on Fast Results on the left menu). Both websites show the results of the races almost instantly after the race are over. Both websites show a version of the results called the “Fast results”, where only the top few positions are displayed. To see more positions, you’d have to wait for the “Full results” version, which will be displayed usually 10-20 minutes after the race. The benefit of viewing the full results on Sportinglife and AtTheRaces that you can also see the distance which the winning horse won by. This can be great to check if your horse has qualified for Williamhill’s 2 Clear offer or Coral’s beaten by a length offer. You can check if your horse has won by 2 lengths or more, or if your horse finished 2nd under 1 length or less. Another quick way to check the winning distance is on Bet365. After a race has finished, you can click on the race on Bet365, and it will show you the results of that race, along with the winning distance. However, Bet365 will only display results of a race 10-20 minutes after a race has finished. It's always an excellent outcome when the horse race result means you have qualified for a free bet! Free bets are usually credited to your account 10-30 minutes after the race is settled. Some bookies take longer than this, so don’t worry if you don’t have your free bet in 30 minutes. If 24 hours has passed and you still haven’t received your free bet, you can try chatting up the bookie’s Live Chat. They might have made a mistake or there might be a problem with their system. Most bookies allow your free bets to be used on any sport, but some bookies will only the free bet to be used on horse racing only. Try to use your free bet on 5.0 odds and above on SNR mode on the calculator to maximize your profits. 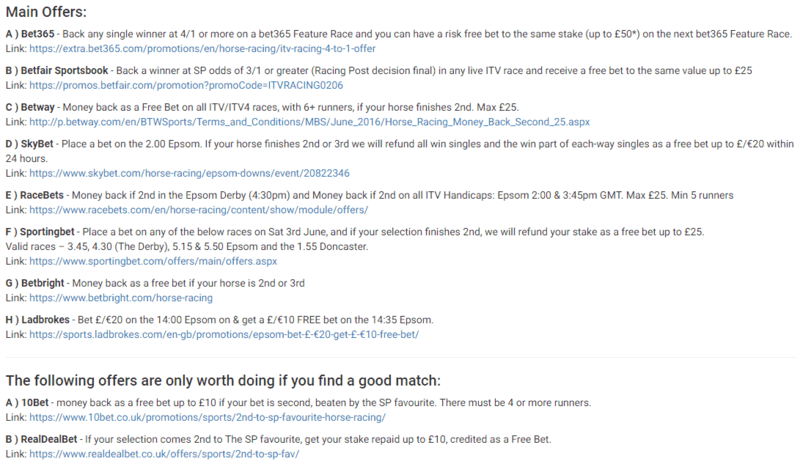 One exception is Bet365 offer (offer guide), where instead of giving you a free bet, they would give you a risk-free bet on the next ITV race. This means that if you place a bet on the next ITV race and your horse loses, they will refund your stake back to you as cash. However, to place the risk-free bet, you would need to bet on the next ITV race with your own cash first. To profit from a risk-free bet, use the Calculator on SNR mode as well, as your stake will be returned to you if you lose, which makes it a free bet of sorts. This is great, as you can use the risk-free bet on the next ITV race and it would qualify for their horse offer as well! That means that if your risk-free bet wins at 5.0 odds and above, you would get another risk-free bet! Please note that your risk-free bet will only apply to the very next ITV race only, and will not apply on any other race, even if it’s another ITV race. If the race that you are betting on is the last race of ITV racing, and your horse won, your risk-free bet would be on the first race of the next ITV racing day, which would usually be next Saturday. Don’t worry that you’ll forget, as Bet365 will normally send you a reminder on the day before that you still have a risk-free bet for the next day’s ITV racing. ITV racing offers always happens on Saturdays, but it might happen on other days as well! When big horse racing events happen, like the Cheltenham festival or the Grand National, ITV racing offers will take place for a few days straight, which can give you lots of profits risk-free! Keep a lookout on the Oddsmonkey Daily Offer Calendar, where they will post about big horse racing events. Get up early in the morning before the first race starts, get my Oddsmonkey Racing Matcher up and check for close matches of odds below 8.0. If I manage to find a close match, I place my bet for that bookie. If I can't find a close match in the morning, I’ll wait till about 30 minutes before the race starts. At this time, I’ll close the Racing Matcher tool, and have my Calculator tool ready. I’ll manually check the odds as they change, and if I manage to find a match where I would have a qualifying loss of £1.50 per £25 staked, I place my bet and lay it. After I place my bets for all the bookies for the main offers, I can either take on the additional offers, or I can start to look at the next ITV race. If there are good matches on the additional offers, I’ll take them on, and if not, I’ll start to look at the next race. After the race has settled, I’ll continue to watch the odds for the next race, and if I manage to find a good match, I place and lay my bets. About 15 minutes after the first race has finished, I check the results on Sportinglife to see if I had qualified for any free bets. I’ll continue this until the day’s races are complete, then start to look at mug bets. I’ve set up a filter on the Oddsmonkey Oddsmatcher tool to look at horse racing matches on the bookies that I use for ITV racing offers. I normally place about 5-6 horse mug bets on other races on each bookie to keep my accounts with them healthy. It can be highly suspicious if you only bet on races that qualifies for offers and can get you gubbed very quickly.